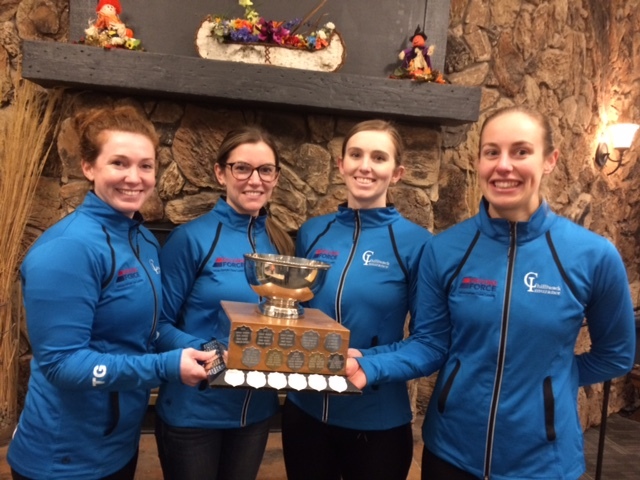 Abbotsford’s Team Wark won their second BC Women’s Curling Tour event in a row this past weekend at the Kamloops Crown of Curling. Sarah Wark’s team of Kristen Pilote, Carley Sandwith and Michelle Dunn faced the hometown team of Corryn Brown, Erin Pincott, Dezaray Hawes and Ashley Klymchuk in the semifinals, progressing to the women’s final with a 7-4 win. The second women’s semifinal also finished with a score of 7-4, with Kim Slattery’s Vernon team of Alyssa Kyllo, Kelsi Jones and Morgayne Eby coming out on top over Brette Richards’ Kelowna team of Steph Jackson-Baier, Heather Tyre and Blaine deJager. Team Wark went on to claim their second BC Women’s Curling Tour victory with a 6-2 win in the women’s final over Team Slattery. A second Abbotsford team, Team Geall, won the men’s event, progressing to the final men’s draw after edging out Vernon’s Team Cotter in the quarterfinals and Japan’s Team Usui in the semifinals. Japan’s Driving Force Cashspiel champions, Team Matsumara, took on Golden Ears’ Team Barry in the second men’s semifinal. Tied after seven ends, Josh Barry’s team of Sebastien Robillard, Jay Wakefield and John Cullen scored one point in the final end to win 7-6 and move on to the men’s final. Sean Geall’s team of Jeff Richard, Andrew Nerpin and David Harper claimed their first BC Men’s Curling Tour victory in the final men’s draw with an 8-5 win over Team Barry. Scores from the men’s event can be found here and scores from the women’s event can be found here. The next BC Men’s and Women’s Curling Tours event is the Raymond James Kelowna Double Cash at Kelowna Curling Club from November 2 to 4.